This was, to say the least, a difficult joke to bear, both hilarious and deeply, unforgettably sad. I almost wish I didn’t hear it, but I’m also glad I did. The poems in Jack Christian’s second full-length collection, Domestic Yoga, are filled with just this kind of quiet, soul-probing humor. Jack is in many ways a gentle poet; he sees the world with soft eyes, almost like a kid, but at the same time, he is fractured, disgruntled, ambivalent about his loves and art, all of his praise and yucks hedged by tragedies both feared and remembered. He is, I think, the way hearse-flowers look to both father and son, the scared and the naively awed, simultaneously. Enjoy the interview, and buy his book! GL: A while back, I saw this married couple with their children at North Station in Boston. They were tourists and arrayed as such, with backpacks, sunhats and sunglasses, their kids in bjorns and strollers. They were in complete synch with each other, but they never looked at each other the whole time I saw them. Instead, they seemed to share a sightline, a goal, and were focusing entirely on their shared destination. The protagonist-couple in Domestic Yoga appears, though settled and sedentary, to (at their best) cohere in the same way. They “tacit[ly] mirror” each other but seem often enough united by where they’re heading rather than how they directly regard each other. Do you agree? 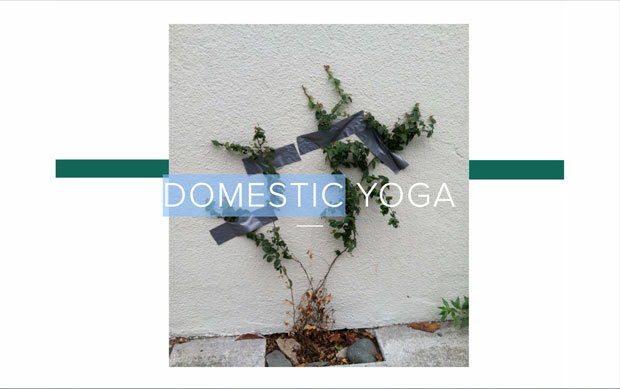 If so, how does this domestic mode relate to yoga? And how do your poems take yoga as a model for movement and theme? JC: That couple you describe, that’s about right. Except that in the poems the couple is mostly inside, and most of their interactions are of the private, in-home distracted-by-screens variety, so whereas the train station couple has a reason for their forward focus, the poems’ couple share a much less directed one, a more static and diffuse sense of union. Their “direct regard” for one another, for the speaker, at least, (for me,) is necessarily pushed beneath the surface because that regard, their initial romance, their daily intimacy, has become ordinary, sublimated, tasked, complicated. I suppose this relates to yoga in an earnest way, and not just the jokey way I intended when I first started calling the manuscript Domestic Yoga. In one of our phone calls, just after you told me about your power-lifting, you said something about the book detailing “the ways we contort ourselves through domestic life,” which I told myself to remember so I could use it later – in answer to your own question, it turns out. But, I think what you said is maybe a best explanation of why the book is called what it is. So how does the domestic mode relate to yoga? That’s a good question. I think I connect the two by thinking about domesticity as a state of being, a pose. And yoga is an intentional practice where one focuses on being. But then that’s complicated by yoga’s popularity and commodification. A practice of intentional being slides into escapism, notable as much for what happens in the yoga studio as for the latte one treats oneself to afterward. Awareness flirts with oblivion. There are of course many forms of yoga, but my speaker doesn’t really know that. He’s just talking about like Regular Yoga. When I first started writing these, I wanted to make something of idle thought, even of thoughtlessness. That happy, boring place. So, yoga became a kind of parallel in a few ways: as a true, spiritual discipline, as the desire for such, and also as a uniquely ubiquitous, superficial and bastardized form. GL: A number of lines and images in the book depict peace as kind of domestic stasis, away from the rest of the world. Is it fair to say that your notion of peace is domestic rather than social? That is, that you think happiness, fulfillment, etc, happens in the home more so than in our various social and political communities, poetry included? I’m saying nothing new, but I can say more: I do think happiness, fulfillment, etc happens at home because of our alienation from social and political communities, their fracture. And so, to even find a community of two becomes remarkable. GL: In “Poem in Film,” you bring up and, describe is not quite the right word but, describe “this great non-narrative movie I make / called Life in In-Between Gestures.” Does poetry fulfill some kind of filmic ambition for you? And what is life in between gestures? Is that a realer life than the gesture life? What is the gesture life? etc. JC: I’m interested in poetry as an experimental means to document that-which-can’t-be-documented. So there’s your camera-metaphor. That’s my filmic ambition. A splicing of interior fragments. Making a found film of cutting floor scraps. I don’t know if that’s “realer” or not, but it is different from the “gesture life.” The “gesture life” being our outward performance, perceptions we think we can control, shtick we’ve got down. The “in-between gestures,” then, imply a focus not on the trees but on the spaces, the light between them. (This leaves / tree example is lifted directly from reading Carlos Castaneda as a 10th grader…seems right…) I have some desire to collect throw-away thoughts, carry them around like they’re my nature friends, use them to make wallpaper, make the wallpaper not the background but the focal-point of the room. GL: This book seems to straddle eras. On the one hand, it obliquely documents the subjects of family life, parenthood, etc., which is common enough for our generational cohort of poets; but on the other hand, the tone and turns are so inward that the book reminds me of some mid-00s indie cinema and music—introspective art that withdraws from social and political problems, which seem, in the aggregate, overwhelming, almost un-addressable. And in this latter way, your poems seem distinct, both aesthetically and perhaps even ideologically, from post-Twitter poetics. Would you agree? And, in general, do you think that your poetic project is more invested in sorting out the past (the influence of your mentors, your aesthetic roots, the tradition from which you emerge, etc.) or the present (responding to your contemporaries and historical moment/situation)? I’m inclined to agree with you on all this, but I’d be interested to hear you define “the ideology of post-Twitter poetics”…Maybe that’ll help me for the next book. I think in the poems of this book I was feeling a little fed-up with the reverence (my own and others) that poets claim to have for poems and one another, calling each other “Lovelies” and “Darlings,” and the like. I started to feel a little gross about the idea of Saying Something. Started to fantasize I’d be publicly shamed for some misstep, in the same way one might, while listening to Fresh Air, imagine being interviewed by Terry Gross. Started not to believe anyone who claimed to bay at the moon. Started to think most everything was disingenuous, a pose – even home life, to an extent. Wanted above all else to stay cool, even in the face of such ennui. Ideally I think I wanted to draw away from the idea of address at all. A real duck and cover. I think of this as a stoner book, even though in the last five years I’ve rarely been stoned. Maybe it’s a late-90’s vibe actually? All this 90’s nostalgia makes me account for the ways I’m still a high-schooler. GL: In “The Pond” you conclude, “We’re all pretending you don’t have a disorder.” What’s your poetic disorder that we’re all pretending you don’t have? I suppose the above answer is evidence. Plus obsessiveness. Plus some desire to play with language as opposed to, say, grade papers. The inability to stop. The compulsion to say something just because I thought of it, and ignoring what it might mean. When I wrote the line, I liked it because I felt it delivered a kind of gut-punch. It’s a withering thing to say, to oneself, to someone else. I imagined it being said at the end of some familial argument, a door-slamming afterward. Or else, as the over-the-top thing one says at the end of a dust-up. The mal-mot that proclaims, basically: “We’re arguing, and now will commence saying hyperbolically foul things to one another.” A rhetorical putdown, really, that transforms arguing into the performance of arguing, and without which I am fairly certain my marriage would not survive. GL: In “Mother of Sadness” the speaker (Jack Christian) says, “I imagine myself repentant of my own ambivalences.” Does ambivalence require repentance? What are your ambivalences when it comes to poetry (or anything else)? See above. At base I’m a disgruntled idealist. And I do feel ambivalent about participating in what feels like such a close and closed community as poetry can be or feel like. There’s also the related ambivalence of organizing one’s life around it, that vow of poverty, the breadwinner anxieties that being a poet exacerbates. And yet, I also think ambivalence is itself a kind of poetry – things held in tension with one another, that one of the things poetry is uniquely suited for is documenting ambivalence. When you ask, does ambivalence require repentance, I think yes and no. No, because ambivalence is not bad in itself, but yes in that repentance is what one does when seeking peace or salvation. I’d like to be saved from my ambivalences, and delivered into clarity. And my tools for salvation (the ones I’ve inherited, anyway) are repentance. (My last name is Christian, for crying out loud.) 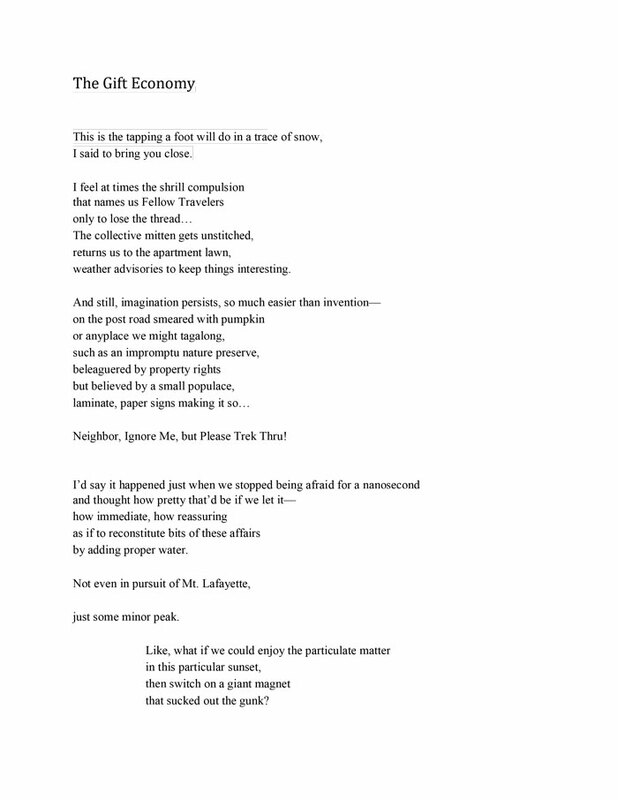 To me, that poem, those lines are a convoluted wish for clearness of purpose, an ambivalent wish for insight – ambivalent in that insight would imply giving something up, too. Namely, ambivalence Please stop me. GL: Why do you keep writing books of poetry, Jack? What do you want out of this whole enterprise? Most simply, I’m an avant-garde-ist, maybe a sheepish or slacker one at times. But on some level I’m always wanting new ways to render consciousness, the fullness of it, the uncertainty, humor, excitement and fatigue, etc. Inside of that, I want a sort of elegant form that masks whatever difficulty with plain-spoken candor. I want easy reading, at least on the getting-to-know-you level. The hook of a good sitcom. The depth to be haunting in various ways. That’s what I want to read, anyway. Also, there’s some attraction with bumping against not so much what can’t be said, but what shouldn’t be said – an attraction to irreverence, the dead-ends of thought, the worm-holes we shouldn’t leap down, the stuff we’re obliged to leave out from the dinner table and staffroom conversations, that which is just noise or is regarded as such, the feelings one shouldn’t cop to on Facebook, the things that won’t help one get promoted, what one thinks about poetry but can only say obliquely in a poem. Anyway, I wrote these poems at a time – early marriage, preparing for a first child – when I felt less capable of reaching beyond myself, more flummoxed by the world and my place in it, more circumspect and out of synch, more isolated, not yet old but capable of imagining getting older, and somehow both more and less worried about any of it. In short, I felt I had nothing to write about. I felt most motivated to live simply and efficiently, to conserve energy, to budget time more diligently. It crossed my mind that I might just sort of peter out as a writer. After all, the only person who would have minded overly much was me. But then, eventually, I began wanting to prove I could make something out of the most banal, the closest stuff, that I could collage it together as a sort of MacGuyver trick, or a way to put a frame on this moment, to look at it, see what’s there, maybe later revisit it, connect it to other larger things possibly, at least to remember it. Jack Christian is the author of the poetry collections Domestic Yoga (2016, Groundhog Poetry Press) and Family System (2012, Colorado Poetry Prize / University Press of Colorado). He holds an MFA from the University of Massachusetts Amherst’s Program for Poets and Writers, and an MA in English and Creative Writing from Hollins University. Recent work has appeared in journals such as Green Mountains Reviewand Carolina Quarterly. He teaches composition and creative writing at Westfield State University, and lives in Holyoke, Massachusetts with his wife and daughter. Visit his website here: jackchristian.ink. Gregory Lawless is the author of, most recently, FAR AWAY (Red Mountain Press, 2015) and DREAMBURGH, PENNSYLVANIA (Dream Horse Press, forthcoming).